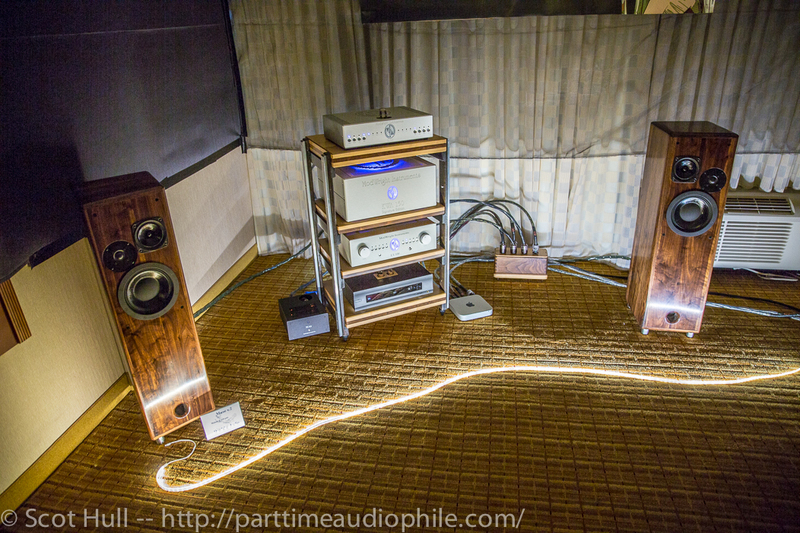 Scott Dalzell of Viva Hifi was reprising his CAF setup here at RMAF, with the “little” Daedalus Audio loudspeakers, the Muse v2 ($7,850, now with Stillpoints footers). 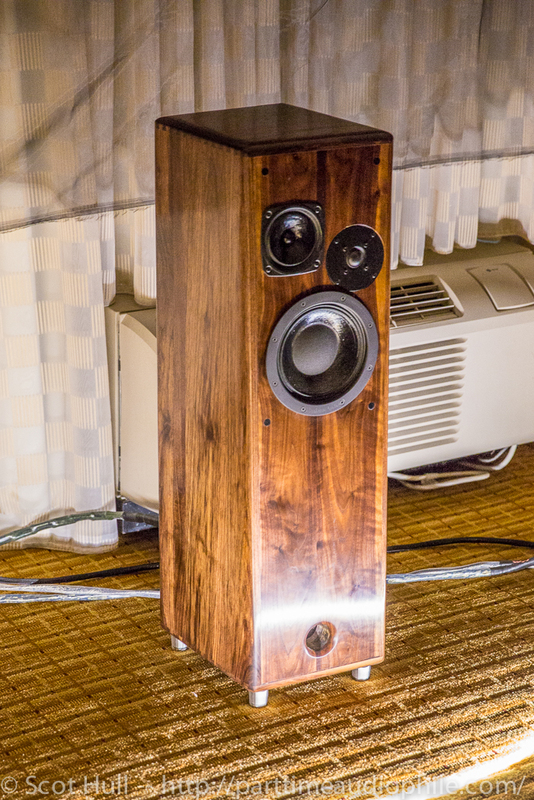 These speakers, set kitty-corner across part of the short-wall, were able to throw one of the most insanely realistic and tactile images I found at RMAF. Yes, this was eye-popping, and if I’d had a pen, I’d have been scribbling “Contender for Best in Show” all over it. 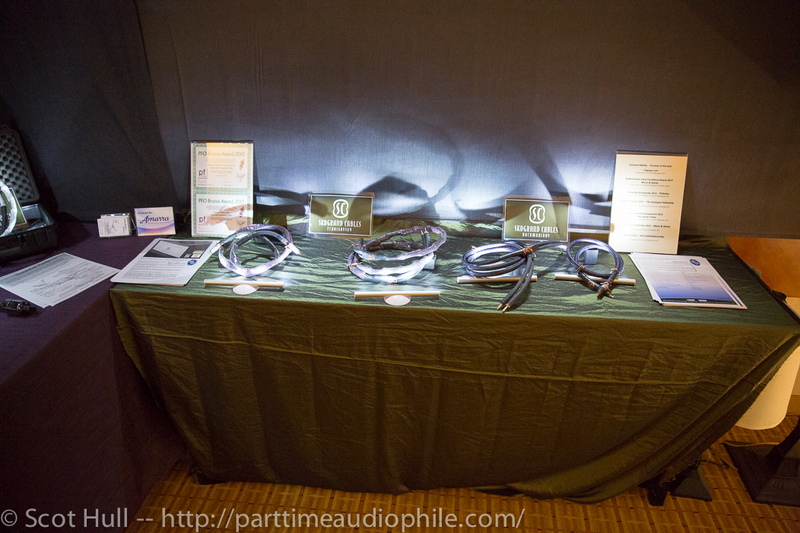 I remember really liking the sound of these components back in DC, so I was surprised by the big jump up in performance. Scott, who was kinda grinning and seemed a bit sheepish, said that Lou had once again reworked the Muse’s crossover network. The result was … yeah. Better! 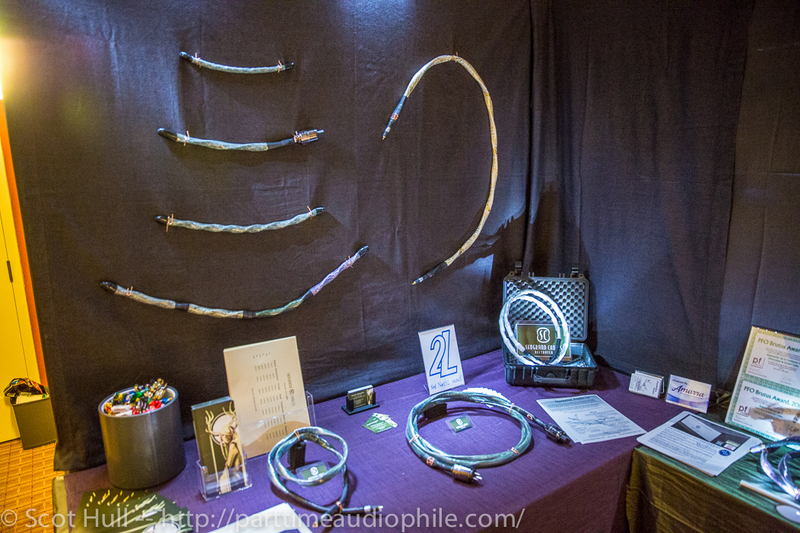 I was also eyeing the new cable loom that Scott had brought along in the form of Knut Skogrand, he of the beautifully-skinned audio cables that bear his name. 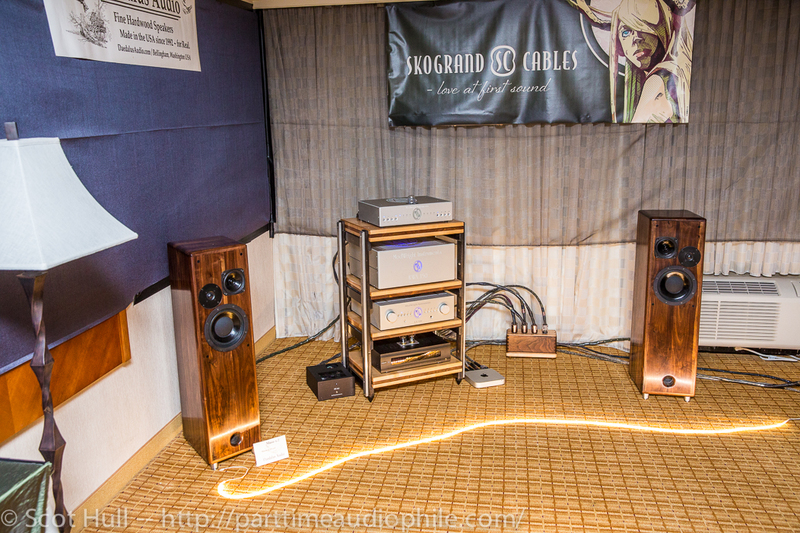 Sitting penultimate in the line, the Tchaikovsky cables start at $6,950 (!) a set (interconnects and speaker cables) and feature four 12awg runs of UP-OCC solid-core copper. The dielectric is also unusual, being 99.82% air. A Teflon “tube suspension framework” encases. I have no idea if any of this matters, but Knut says the construction is labor intensive — it takes him a week to make a set. All that aside, what catches the eye, however, are the outermost layers. The patterns on these things have to be seen to be believed. Just stunning. 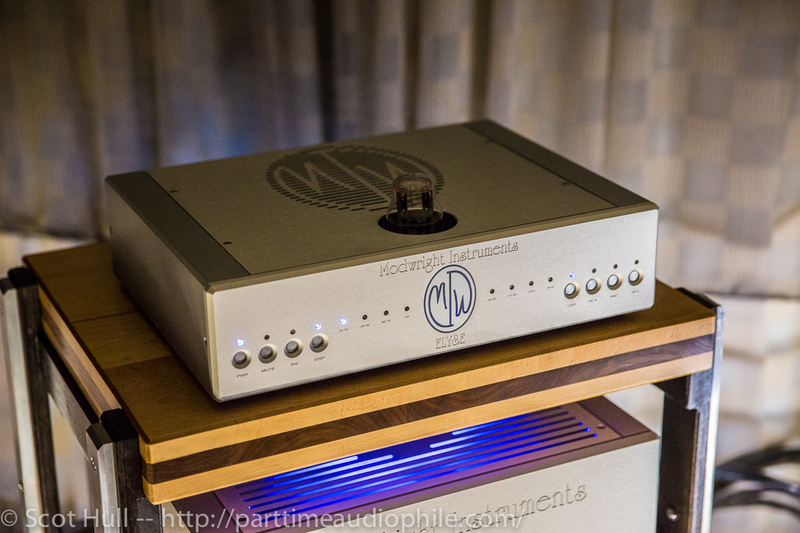 The electronics were sourced from ModWright, and included the new Elyse Tube DAC ($6,900), which features a transformer coupled tube output stage and supports 24/192 over USB, AES and S/PDIF. 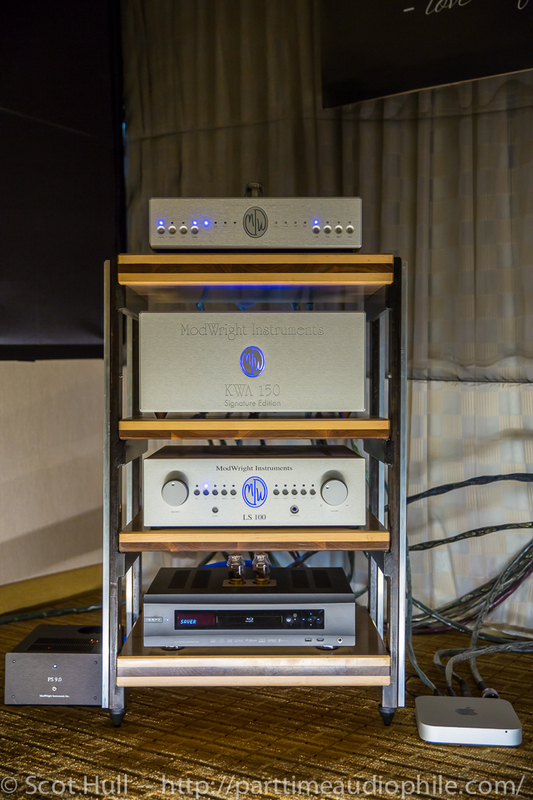 The single-ended LS 100 tube preamplifier ($3,750 — DAC and phono options are extra) was paired with the KWA 150SE stereo amplifier ($8,995), putting 150wpc into the speakers. 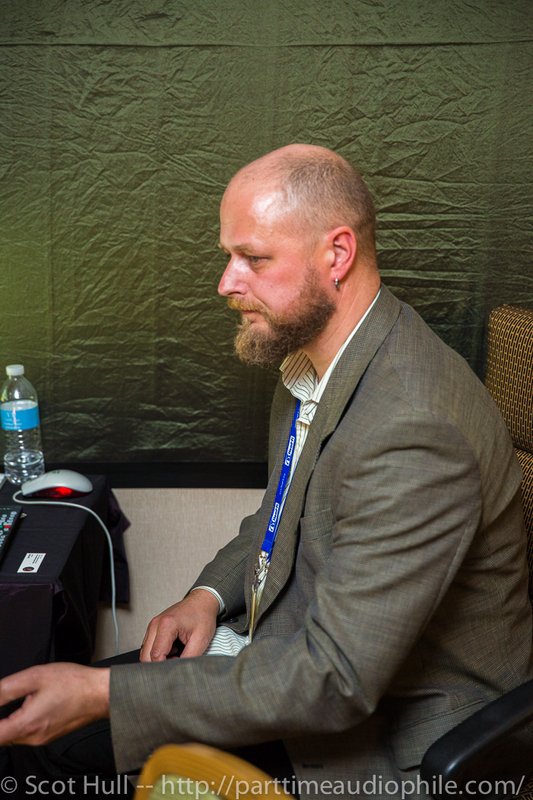 A Daedalus/WyWires Power Broker was used for distribution. 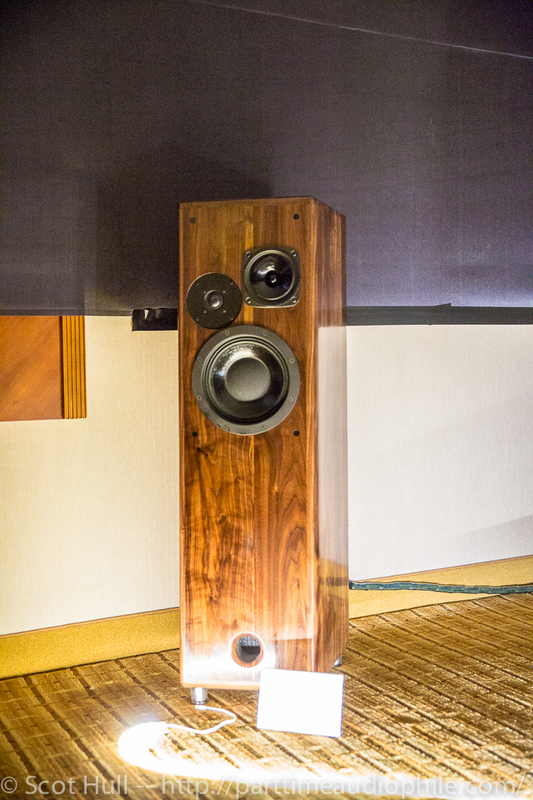 A ModWright modded Oppo BDP-105 ($2,495 for the mod) was on hand in case anyone brought CDs. This room was not inexpensive, but it wasn’t overwhelming either. 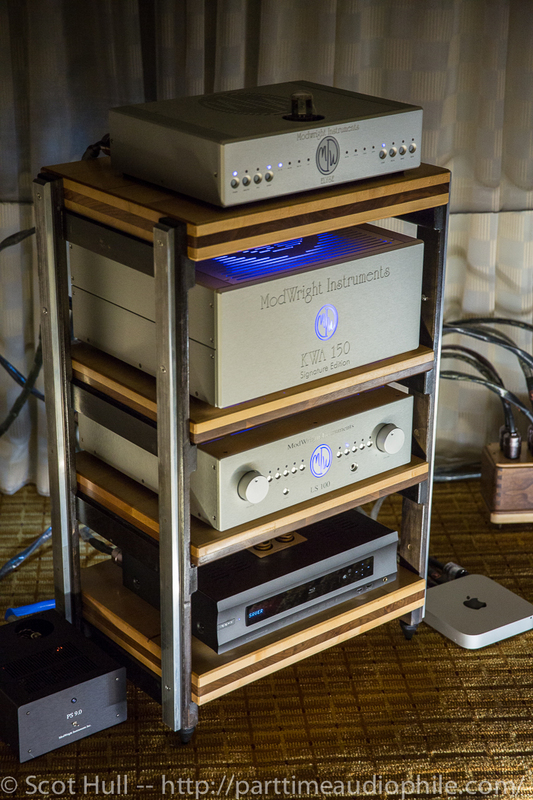 For about $30k (w/o cables), the system was just shockingly great.